Here are some resources for the CPACFL attendees who are participating in the Lakeland FL event December 1-2, 2017. 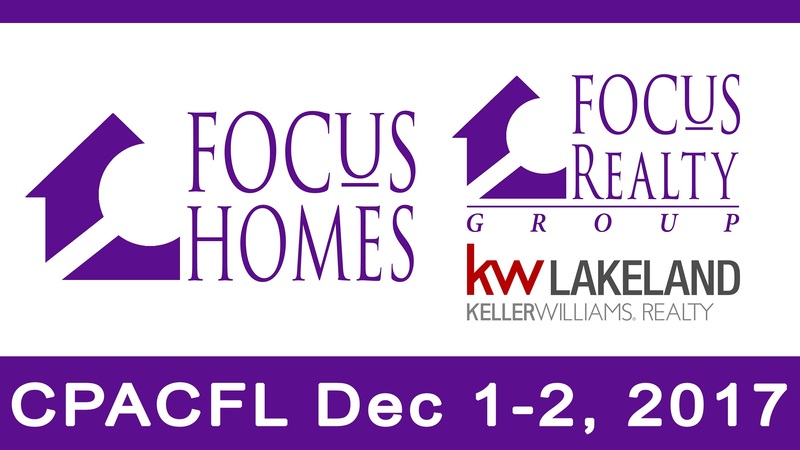 Focus Homes and Focus Realty Group, KW Lakeland, are proud breakfast sponsors for this event and will be on site in person in the morning on Friday 12/1/17. Have you been thinking about selling, buying or investing in real estate in Florida yourself? We can help with all of your specific needs. 1) Selling resources. Get community sales information (for any property in the US) here. 2) Building resources. Get information on the custom home design build process here. 3) Buying resources. Search available homes for sale in Central Florida here. 1) Clients involved in a divorce that need to sell and buy in any US State. 2) Clients involved in probate that need to sell ﻿in any US State. 3) High net worth clients looking to buy real estate investments, who are looking to sell and divest some of their assets, or who are seeking to purchase an additional personal residents or a vacation home in any US State or abroad. 4) Clients that need to sell or buy real estate for any reason in any US State. 5) International clients looking to invest in US or Florida vacation homes, villas, long term rentals or a private residence. If you would like to communicate directly with the team leader, call or text Jared at 863-640-2246 or contact us online today.